A copy of Time magazine’s cover emblazoned with Donald Trump’s image has reportedly been hanging in five of his golf clubs. According to Time magazine, it’s fake news. The March 1, 2009 edition’s cover shows the president wearing a black suit and a stern expression, his arms crossed. “Trump is hitting on all fronts… even TV!” reads one cover line. 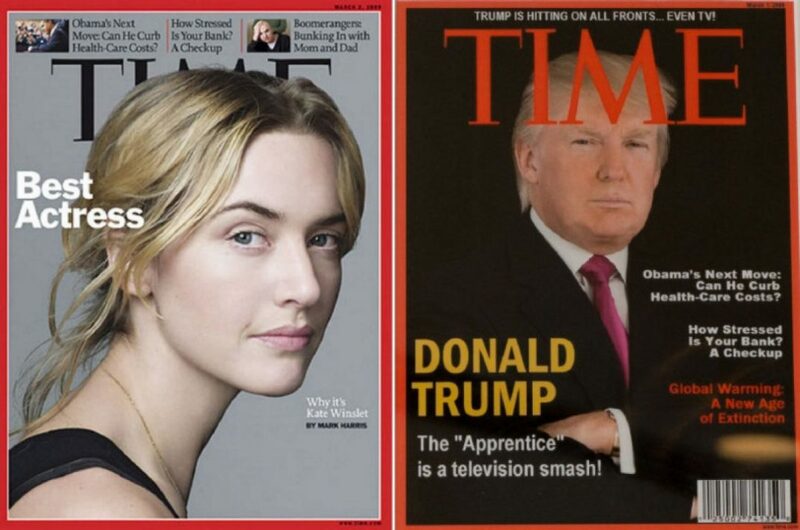 Two of the smaller headlines – which promise stories on President Barack Obama, climate change, and the financial crisis – were taken from the genuine March 2, 2009 edition of Time, whose cover star was Kate Winslet. Time has said there was no March 1, 2009 issue of Time, and Donald Trump did not feature on the magazine’s cover that year. A spokesperson said the magazine had asked the Trump Organization to remove the fake cover. The Washington Post, which first reported the story, said the mock-up had been displayed in two spots at Donald Trump’s resort in Doral, outside Miami. It also hung in the members’ dining room at the Trump golf course in Loudoun County, Virginia. Photographer Scott Keeler tweeted a picture showing it on the wall of the Mar-a-Lago club in Palm Beach, Florida.